Gabriel Omar Batistuta Bio shows that he had played most of his career in the Italian league where he earned his nickname "Batigol". He is one of the strongest finishers in the world and his shots on goal are mostly hard venomous kicks that the goalkeeper sometimes has a hard time seeing let alone keeping out of the net. Batistuta did not develop an interest for soccer/football, but rather started playing basketball in the early age until after the 1978 Fifa World Cup where his passion for soccer started developing. Gabriel Omar Batistuta signed his first professional contract in 1988 with Newell's Old Boys where he was coached by Marcelo Bielsa, who later became Batistuta's coach with the Argentine national team. Batistuta bio as a professional soccer player starts off slow as his career did not take off because of many factors but main problems he struggled with were being away from home and his family sleeping in a small room at the stadium. He also had trouble with weight that slowed him down as a soccer player. In 1990 Batistuta was seen as a prospect by one of the biggest Argentine clubs Riverplate and was offered a contract to come and play for the Argentine giants. Although Batistuta bio shows him scoring impressive 17 goals, Batistuta had numerous run-ins with the coach Daniel Passarella and would eventually be dropped from the squad during the mid season. After being dropped by Riverplate, Batistuta joined their arch rivals Boca Juniors in 1990. Gabriel Omar Batistuta did not have a positive impact when he first arrived to Boca Juniors, in fact he struggled during the first year but with a coaching change and Oscar Tabárez coming in to coach Boca Juniors in 1991 Batistuta found his true scoring form. Gabriel Omar Batistuta name was still unknown but coach Oscar Tabárez saw potential in the big Argentine helping him find his confidence as Batigol finished the season as the top goalscorer helping Boca Juniors win the Championship. While playing for Argentina during the 1991 Copa América, Gabriel Batistuta caught the eye of the vice president for Fiorentina who immediately signed the goal scoring machine. During his first season with Fiorentina (1991-92) Batistuta scored 13 goals, however the next season would be disastrous as Fiorentina was demoted to second division. Management of Claudio Ranieri and Batistuta's contribution of 16 goals brought Fiorentina back into first division of Italian soccer after one season 1992-93 in Seria B. It was during this time in Fiorentina that Batistuta found his true goal scoring form and made a mark on Italian soccer and Batistuta bio. During the 1994-95 season Batistuta managed to score 26 goals making him top goalscorer of Seria A which also made him recognised, respected and feared striker in the Italian Seria A. This season Batistuta also broke Ezio Pascutti's 30 year old record by scoring in every match during the first 11 games. After spending almost 10 years with Fiorentina and not winning the Scudetto, Batistuta made a move to one of the biggest clubs in Italy, AS Roma. His sole reason for doing this was to win the Italian League for once in his career. He goal was accomplished as AS Roma won their first Scudetto during the 2000-01 season where Batistuta contributed by scoring 20 goals during this season. His form diminished after winning the Scudetto and eventually he was loaned out to Inter Milan. After arriving to Inter Milan in 2003 Batistuta scored only 2 goals in 12 matches which was the sign that Argentine's career is coming to an end at the age of 34. He made one final move to Qatari team Al-Arabi on a free transfer where he broke another record for goals scored held by Qatari Legend "Mansour Mouftah". He scored 24 goals during the 2003-04 season to brake the record and also receive the Golden Boot as a top scorer in all Arab leagues. 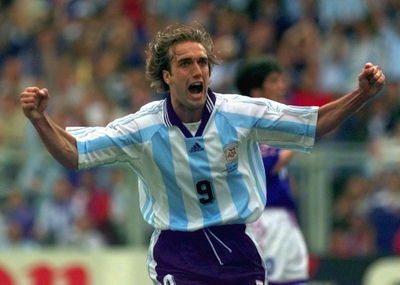 Injuries forced Batistuta to retire in 2005.